The central square will have more than 350 retail outlets, cafés and restaurants. 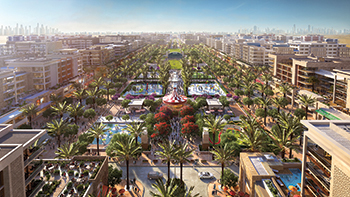 Dubai-based developer Nshama expects to award the construction contract shortly for the first 1,000 townhouses of its newly launched Town Square development, which sits at the intersection of Al Qudra Road and Emirates Road in New Dubai near Al Barsha. The developer also intends to issue tenders for the construction of the first 1,700 apartments, which are currently in the final designing stage. Town Square will have more than 3,000 townhouses (ranging from 2,153 to 2,422 sq ft in size), 18,000 apartments, 350 shops, one Vida hotel, parks, healthcare facilities, schools and cycling trails. The urban metropolis features an outdoor lifestyle that promotes the wellness of residents in a vibrant, unique and trendy development with all amenities within walking distance. The entire project, which spreads across 31 million sq ft, is due to be completed over a period of 10 years. The development cost of the first 1,000 townhouses is Dh1 billion ($272.261 million) and they are scheduled to be completed in 2017. Zahra Townhouses will be the first residential phase in Town Square, and will offer a choice of three- and four-bedroom homes. An artist’s impression of the Town Square. Zahra Townhouses are distinguished by spectacular green landscaping set around the community. A green trail runs throughout the neighbourhood bringing a serene and soothing calmness. Acres of parks with water features, jogging and cycling tracks, as well as state-of-the-art healthcare facilities, swimming pools, outdoor gymnasiums, skateboard parks and children’s play areas promote healthy living. Residents will also have easy access to schools within walking distance and to the popular Al Qudra cycle track. With efficient lay-outs that take into consideration the day-to-day needs of residents, Zahra Townhouses are smartly planned with three-bedroom townhouses, ranging in size from 200 to 208 sq m, while four-bedroom units cover 225 sq m. All townhouses have balconies, with most of them opening to the green vistas enveloping the community. The townhouses also have a private rear garden, room for domestic help, open bistro kitchen layout, storage utility areas and covered garage. In-built cupboards, high-quality fixtures and finishes are standard across all homes, which also have high-speed fibre-optic data connectivity. Zahra Townhouses ... smartly planned. Zahra Townhouses are located within walkable distance from the main square, which has several retail, food and beverage (F&B) and leisure outlets. Further, it is located near the entrance of the project, in easy proximity to popular malls as well as the Al Maktoum International Airport, which is less than 20 minutes away. The project will also include a Vida Hotel featuring 180 hotel rooms and serviced residences. Vida Town Square Dubai will be elegantly designed with stunning contemporary architecture and fashion-forward interior concepts. It will draw on the breathtaking greenery of Town Square by providing vast open spaces that exude natural light, lending vitality and vigour. An array of innovative and value-added services await guests at the hotel including smart technologies that enable them to access all amenities at the tap of a finger through iPads and smartphones. Vida Town Square Dubai will serve as a smart urban hub where inspiring minds stay, play and connect. It will be defined by its location overlooking the central park, the size of 16 football fields, and in easy access to a world-class retail precinct spread over 2.5 million sq ft.
“Going beyond traditional hospitality, Vida Town Square Dubai will offer a remarkable breadth of food and beverage (F&B) choices including speciality restaurants, business centres for seamless ‘work and play’, chic events venues and highly personalised but unobtrusive service. More details on the design and amenities will be revealed in due course,” says Durie. Among planned amenities, Vida Town Square Dubai includes a swimming pool, modern fitness facilities and a dedicated spa. 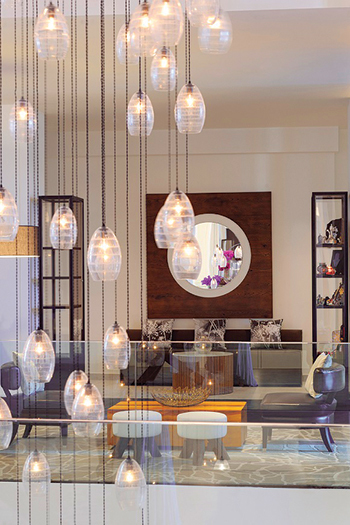 Vida Town Square ... fashion-forward interior concepts. 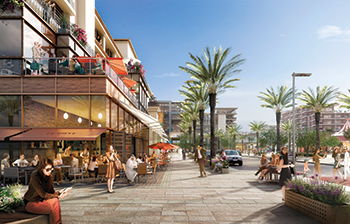 Town Square will also feature a substantial retail, hospitality and commercial space. The masterplan envisages a central hub with more than 600 shops, cafés, restaurants, a shaded public plaza, greenbelts, mosques, educational institutions, healthcare centres, entertainment and outdoor sports facilities. The open-air street cinema will be highlighted by stylish seating, an array of F&B choices and the world’s foremost audio-visual technology for high-quality film-going experiences. The Reel Cinemas Cineplex will feature state-of-the-art projection and audio-visual technologies as well as ergonomic seating and innovative F&B offering. The number of cinemas and more details on the Hollywood chic design concept to be adopted by the Cineplex are expected to be announced in due course. With a total land area of 31 million sq ft, it will have a high land-to-building ratio, thus opening up more open spaces for a greener community. Nshama will roll out the other residential components, including Zahra Apartments featuring one, two and three bedrooms shortly. It is also developing another value-added development in Dubai that focuses on sustainability, culture and education through a joint venture with Mohammed Bin Rashid Al Maktoum Foundation (MBRF).